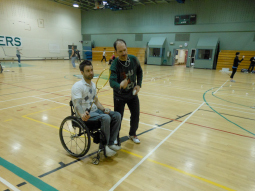 Coach, Eric Boucher, who is also a Canada Games Coach, was instrumental in our para-badminton project where para badminton clinics were piloted throughout New Brunswick during 2012. Six (6) clinics were held with 61 participants, including 27 persons with a disability. Eric’s dedication and adaptability to ensure that all individuals with a physical disability at the badminton clinics were playing to their full potential was exceptional. Eric also did demonstrations outside of his comfort zone using a wheelchair to demonstrate techniques. He is a talented coach and a leader in para coaching in New Brunswick. Are you interested in becoming a para coach? Contact Para NB to express your interest, get linked to your sport and receive information on upcoming training sessions. Para NB works with Coach NB to plan and deliver para coach training and education sessions.